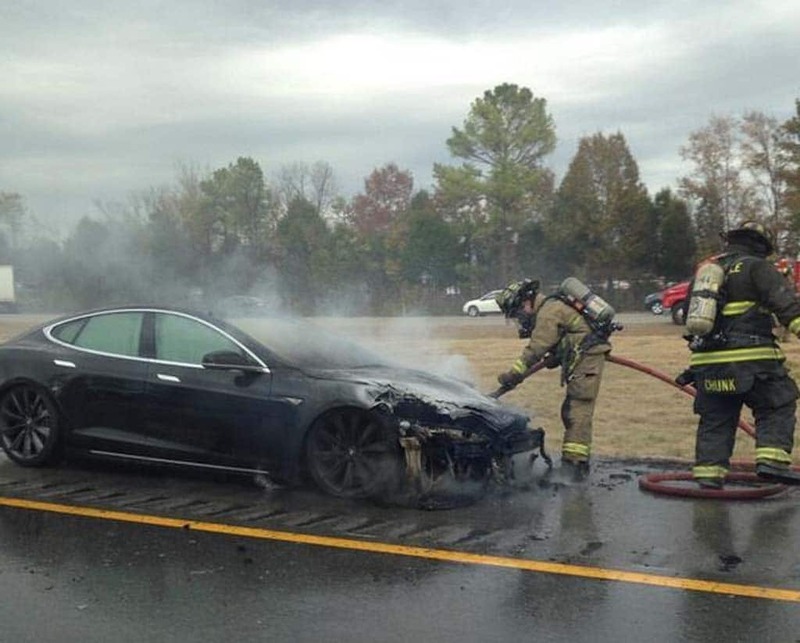 An Instagram image of a third reported Tesla Model S fire in Smyrna, Tennessee. Photo Credit: TeslaMotorsClub.com. Another Tesla Model S battery sedan has caught fire, the third such incident in six weeks, and an event that is contributing to the California carmaker’s sudden stock price plunge. Ironically, the incident occurred in Smyrna, Tennessee, according to the Tesla Motors Club website, the same town where Nissan produces its own battery-electric vehicle, the Leaf. Tesla officials say they plan to immediately investigate the fire which appears to have occurred following a collision involving the Tesla. Two other Tesla vehicles have suffered fires since late September, and the latest incident could raise new concerns about the safety of the lithium-ion technology used by Tesla and other battery-car makers. 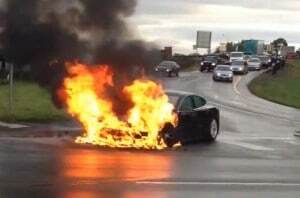 Images of the first reported Tesla Model S fire were widely circulated on Youtube. The automaker said it appeared that the latest fire was the result of an accident and that no one was injured. A report by the Reuters news service quoted a police dispatcher in Smyrna indicating “There was extensive damage” to the Model S that appears to have been caused by metal road debris somehow entering into the vehicle’s engine compartment. That would be a similar scenario to what occurred with the first reported Tesla Model S fire which occurred in a Seattle suburb in late September. Following a company investigation, CEO Elon Musk claimed the incident actually validated the design of the battery-car as that fire – caused when a chunk of metal penetrated the battery pack’s armor – was contained within a section at the front of the vehicle. An onboard warning system advised the driver to park and exit before the fire erupted. Whether motorists – or investors will feel quite so confident after the report of a third fire in six weeks remains to be seen. What is clear is that Tesla has been taking a hammering in the stock market, its shares plunging from a late-September peak of $194.50 to as low as $140 in Thursday trading – though shares began to rebound in late-morning trading. “Reality set in,” Barclay’s analyst Brian Johnson wrote following a conference call with Musk to discuss Tesla’s third-quarter earnings. The California start-up declared a $16 million net profit, though that figure was based on adjusted accounting procedures. Using more generally accepted guidelines, known as GAAP, Tesla would have sunk $38 million into the red. The numbers were actually a bit better than many analysts had predicted, but during the call CEO Musk warned that Tesla is having trouble meeting demand for the Model S – and is diverting some cars from U.S. showrooms to meet demand in Europe where the company is just setting up a distribution network. The big problem is a shortage of the car’s lithium-ion battery packs. Tesla recently expanded its deal with supplier Panasonic but won’t begin to receive a significant increase in batteries until next year. There has been little indication consumers were worried about the implications of Tesla’s first two battery fires. It remains to be seen whether the third incident will start raising concerns that could lead some potential buyers to steer clear of the maker’s showrooms. As for investors, there are signs that some of the recent downturn has been driven by short-sellers. And while Barclay’s Johnson has set a target price of just $141 – nearly 30% below the peak, at least some analysts are running counter to the latest gloom-and-doom mindset. As shares continued plunging Thursday, however, it seems like investors weren’t listening. This entry was posted on Thursday, November 7th, 2013 at and is filed under Automobiles. You can follow any responses to this entry through the RSS 2.0 feed. Both comments and pings are currently closed.